Kelmatt has been manufacturing tennis court wind and sight screens since 1983 and are considered market leaders in this field. 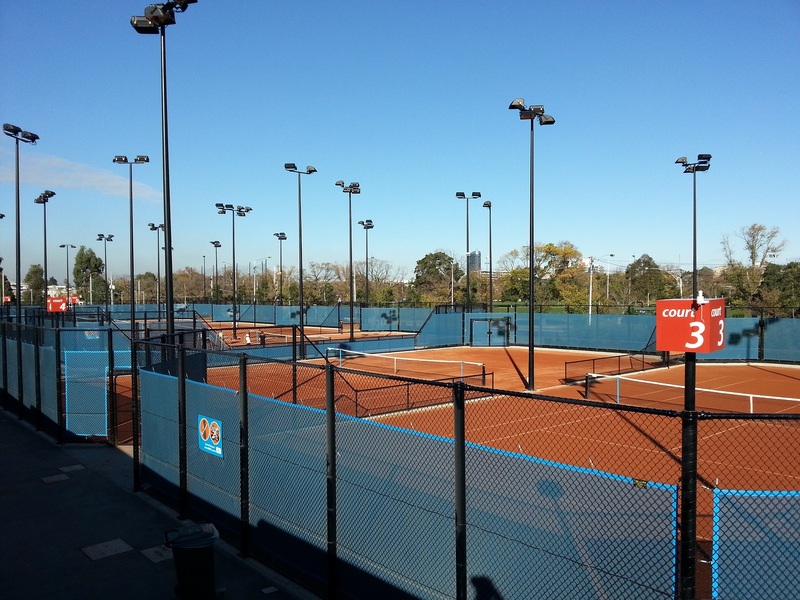 Some of our many major installations throughout Australia include the National Tennis Centre at Melbourne Park, Sydney International Tennis Centre at Olympic Park, Queensland State Tennis Centre, and West Australian State Tennis Centre, as well as many regional and local centres. The fabrics used in the manufacture of Kelmatt screens are specifically chosen for different applications. Superscreen, a P.V.C. coated polyester fabric, is made in Japan and is the preferred fabric where wind is the major concern. The density of the weave is 75% which allows only 25% of the wind to flow through the fabric. A 75% mesh will give protection 10 times the height of the screen down court before the wind regains its original velocity. This means a screen 2 meters high offers protection 20 meters down court. Kelmatt screens typically have a life expectancy of 10-12 years. This is not only due to the fact that the materials used are UV stabilized against early degradation from the sun, but attributed also to the manner in which the screens are fabricated and the quality of the components used. The Kelmatt system incorporates the use of stainless steel D rings in preference to conventional eyelets. Results show that the eyelets pulled out from the fabric at 25kgs force, whereas the D ring system actually tore the fabric at 85kgs force, leaving the D rings fixture intact, proving greater tensile strength under extreme wind load conditions. Kelmatt Screens are also fixed to the fences with galvanized steel tension springs. This system is preferred to plastic ties or cord lacing because it allows the springs to flex with wind gusts thereby relieving some tension from the fence and screens.